Niagara Falls turns into a Wonderland in Winter–as in you will wonder why you never took a winter trip to Niagara Falls before! Festivals, concerts, workshops, conventions, plus all of the tourist attractions, restaurants, two world-class casinos, and of course the Falls are among the many things to do this winter in Niagara Falls. The city of Niagara Falls truly does go all out for the holiday season with the Winter Festival of Lights and its associated events including the Opening Ceremonies, Cascades of Fire, Deck the Falls, and the Winter Firework Displays. The display route takes you on a whimsical journey along the Parkway, where you will find the perfect setting for winter fun and photo bombs! Build a snowman in Dufferin Islands or Queen Victoria Park, or better yet book a room and stay for one of Canada’s longest running New Year’s Eve Celebrations at the Falls! With musical entertainment, fireworks, food and beverage vendors, as well as a few surprises, it’s a perfect way to ring in 2019. This year’s line up includes local Niagara band Avenue Inn (winner of the band of the year), Canadian favourites The Sheepdogs, multi-platinum musicians Walk Off the Earth, and superstar headliner Burton Cummings! With all this and more happening around Niagara, finding something to do is a snap, however, finding a hotel room is another story. Holiday Inn by the Falls is one of the best located hotels in Niagara Falls if you want to be where the action is. With amazing restaurants like Coco’s Terrace Bar & Grill and the Skylon Tower’s Revolving Dining Room, the Fallsview Casino, Scotiabank Convention Centre, and of course the Niagara Falls all in close proximity, Holiday Inn by the Falls can fill up fast, so make sure you reserve now! While New Year’s Eve is for partying, New Year’s Day is for spending time with your family before everyone is back at school and work. Niagara Falls also has plenty of fun, family-friendly activities to keep the kids happy, all without breaking the bank. With the snow shimmering, the walk along the parkway can be quite beautiful. Dufferin Islands is a great place to start. It offers free parking and is within walking distance of the mighty Niagara Falls, with its own nature trails that may or may not be accessible, depending on snow levels. It may look pretty in pictures, but remember that it can be very cold, so bundle up and bring changes of clothes, mittens, and scarves in case someone gets wet. The Falls in winter sure is something special, glistening with icicles and still managing to pump all that water over the edge at sub-zero temperatures. It’s not by accident that this scene has captivated visitors for hundreds of years. The sight and sound of water rushing over the falls, just a few feet below you, is intoxicating. No glamour. No glitter. Just nature at its very finest. You can continue walking downriver to the bottom of Clifton Hill where you will find an assortment of amusements and attractions. Once you reach the top of Clifton Hill, you will find more attractions as well as restaurants and shops, plenty of places to warm up and get something to eat. You may decide to take a cab back to your car. Compared to parking in a paid lot, this can save you money or at least not cost you more. Remember to set the GPS on your phone in case you forget where you parked after a day of fun in Niagara Falls. 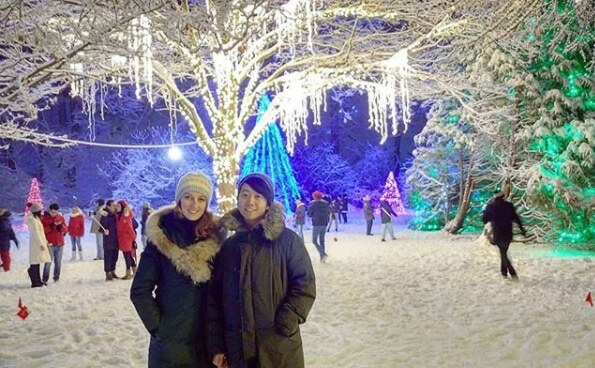 After dinner, you’ll want to make sure and take a drive through the world-famous Winter Festival of Lights: eight-kilometres of illuminated attractions and millions of sparking lights on display along and around the Niagara Parkway between Bender Hill and Dufferin Islands. The Festival is free of charge, but we encourage you to donate at the exit of Dufferin Islands. So there you have it: a bunch of wonderful ways to have fin in Niagara Falls this winter. Hope to see you soon!